The annual IDPF Digital Book conference took place this week in New York, as part of the BookExpo America trade show for the publishing industry. You can count on two topics being discussed at any book publishing conference: Amazon and DRM. IDPF Digital Book 2015 was no exception. One particular panel featured writers from leading book industry trade magazines, and the moderator was Joe Wikert, a well-respected digital publishing executive who is an outspoken opponent of DRM. The discussion turned to the pros and cons of “walled gardens” such as Amazon’s Kindle ecosystem. Wikert remarked on how quickly the music industry got rid of DRM and suggested (as he often does) that book publishers should follow. The usual story is that the music industry went DRM-free in 2009 when Apple completed its removal of DRM from its vast iTunes music catalog. But how true is that? Not very, as it turns out. I’d argue not only that DRM never really went away but that it’s making a comeback. The first thing to recognize is that downloaded files are the only mode of digital music delivery in which the music isn’t encrypted. All on-demand music services (Spotify, Rhapsody, Google Play Music, Beats Music, etc.) encrypt streams as well as music tracks that users download for “offline listening.” And all forms of digital radio — Internet (Pandora), Satellite (SiriusXM), and digital TV (Music Choice) — are encrypted. These modes of delivery are now more popular than download purchases. Music download sales peaked in 2012 and have moved into sharp decline. Based on publicly available subscribership figures and studies such as Edison Research and Triton Digital’s The Infinite Dial, I estimate the total U.S. active monthly listenership to on-demand music services in the 60-70 million range. That’s counting the use of YouTube as a de facto on-demand music service, which The Infinite Dial estimates as more than four times that of Spotify. (The study says that 73% of YouTube music users don’t even watch the videos but just listen.) Internet radio, led by Pandora and iHeartRadio, has well north of 100 million active listeners, while over 27 million people subscribe to SiriusXM. All of these numbers are growing steadily. More recent research by GlobalWebIndex reinforces the trend. The firm’s Q1 2015 survey of teenagers around the world shows that while 60% used a streaming service during the last month, only 21% purchased a music download. 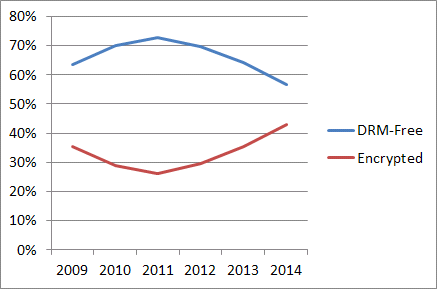 Percentage of recorded music industry digital revenue from DRM-free vs. encrypted delivery modalities. Source: RIAA. This chart shows the percentages of total digital recorded music revenues that come from DRM-free vs. encrypted modalities. DRM-Free includes downloaded singles, downloaded albums, kiosk sales, and ringtones (even though some of the latter may be DRM-protected). Encrypted categories include SoundExchange distributions (all forms of digital radio), Paid Subscriptions (paid on-demand services and premium Internet radio such as Pandora One and Rhapsody unRadio), and Ad-Supported On-Demand Streaming (YouTube, Vevo, Spotify Free). The chart starts in 2009, when iTunes went fully DRM-free. 2008 was a transitional year as two of the major labels (first EMI, then UMG) began to go DRM-free on iTunes, and Amazon launched its completely DRM-free MP3 store. Before then, perhaps 5% of digital music revenue was from DRM-free sources. The trend began to reverse in 2011, when Spotify launched and the major labels completed deals with YouTube in which they allow most of their material to be shown in exchange for a share of ad revenue, resulting in “hockey stick” growth in listenership to on-demand services that continues to this day. From this data it’s fair to predict that the lines will cross, that encrypted modalities will represent the majority of recorded digital music revenue by 2016. As a footnote, the fastest-growing category of recorded music revenue is neither on-demand nor Internet radio; it’s vinyl. Vinyl has come back from near death in 2010; its revenue growth is at 50% per year and accelerating; it now contributes more revenue to record labels than YouTube. Now here’s a rather metaphysical question: should we count vinyl records as DRM-free or not? You decide, but look here first. Hi Bill. You’re right to point out the fact that streaming services still lock files whereas pure download tracks (e.g., buying a song from iTunes) doesn’t involve DRM. And while it’s fair to say the momentum is with streaming services I think we have direct analogies now in books. Oyster and Scribd are the Spotify’s of the book world and I would definitely assume they’ll always need to lock down content. Why? It would just be way too easy for someone to come in one month, download and grab all their reading material for a year or two and not come back till they run dry. And since the business models for Oyster and Scribd are, IMHO, unsustainable, this would only lead to an even faster demise for any of these services that pay publishers full DLP once a reader gets past a certain percentage of the book. The point I was making at BEA is that for the download use-case the music industry moved on from DRM long ago, even before the streaming services came along. Meanwhile, in the book world, publishers are still clinging to DRM for downloads, somehow thinking it preserves their full revenue stream. Btw, as I recently mentioned to a colleague, let’s not get too worked up about the supposed resurgence of vinyl. Yes, it’s back and it’s growing but it’s growing off awfully tiny numbers. It’s mostly high-end audiophiles who are embracing it. I have a hard time thinking we’re all going to have turntables in our living room again anytime soon. I’d be surprised if even 2% of all music consumers ended up going back to vinyl, wouldn’t you? Thanks for weighing in. We all can always count on you for astute observations rooted in the real world. It will be interesting to see if and how subscription services take off in e-books, given how different consumption habits are between books and music. I agree with you (and have suggested elsewhere, http://www.forbes.com/sites/billrosenblatt/2015/04/24/subscription-services-for-e-books-like-netflix-like-spotify-or-not-at-all/) that although it’s very early days for these services, the market is already reflecting some doubt that they will take off as much as subscription music services have, compounded by the major trade publishers’ slowness in licensing their content to those services. As for vinyl: no, it’s not like vinyl’s peak in the 1980s, but you’d be surprised. In 2014, vinyl sales accounted for just under 5% of *total* music industry revenue and is on track to get to at least 8% in 2015. That’s *total*, counting CDs (which are admittedly in free fall). Demographically, the vinyl market has expanded from baby-boomer audiophiles to Gen-Y hipsters. For example, I was at Brooklyn Flea — arguably Ground Zero for hipsterdom — last weekend. I lost count of the number of vendor stalls there offering used vinyl, lovingly cared for in plastic slip jackets. Hi Bill. The vinyl figure you mentioned, 8%, is higher than I would have expected. Then again, I think it reflects just how significant the decline is in paying for music. If there weren’t free services like Spotify I suspect that percentage would be much, much lower. I still have to believe the vast majority of folks buying vinyl are outside the consumer sweet spot. DJs and other snooty audio types must be driving that. I can’t think of anyone I know who even has a turntable these days, let alone is buying LPs. If you poke around a little bit, you’ll find that two new breeds of turntables are hot sellers these days, neither of which are designed to appeal to audiophiles. One is what I would call the hipster-minimal-chic or Warby Parker style model, typically around $300-400, from small companies like Pro-Ject and Music Hall. The other is the type with a built-in sound card and USB output for digitizing LPs, like the Audio-Technica model I have. Same price point or lower. Another thing to consider is that the 8% revenue figure does not include used. As you know, you can’t sell used iTunes files, nor can you sell used e-books, but you can sell used vinyl, and I’d be willing to bet that revenue from used LPs (not a dime of which goes to record companies, of course) is at least 50% of the revenue for new LPs. Yeah, it’s really surprising, even to me. Oops!! I forgot to mention, this was from the Amazon Music store where I’ve purchased thousands of dollars worth of music over the last 10 years. I prefer to own than use the music service. Actually, I do both with them. Go figure.? !